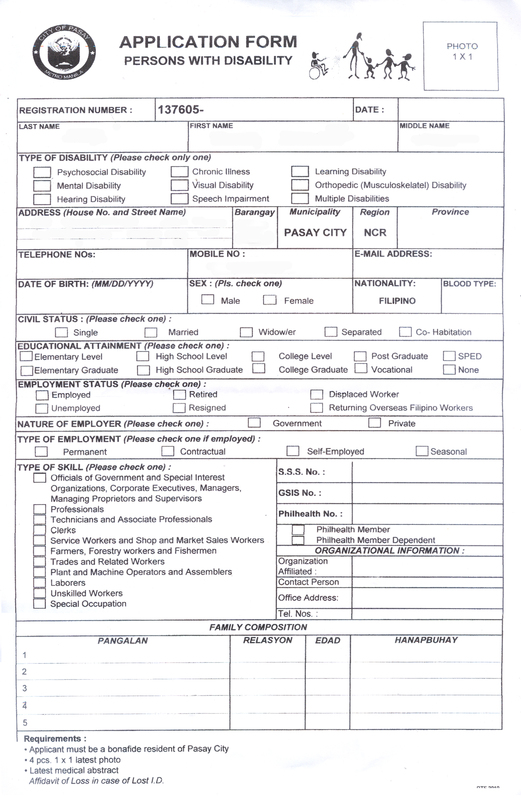 To have an official PWD ID, an application form has to be filed. See the sample below, a scanned copy of the original from the Pasay City DSWD Office. Life is difficult. What a lot of healthy and able bodied people don’t realize is that handicapped people suffer the same trials; death of loved one, loss of job, pain of a breakup, but they suffer through those trials with the additional pain and hardship of disability. Thanks for fighting for this. Thank you for being compassionate to the people I am advocating for…What you said are all true! Fortunately these recent years, persons with disability are bonding together and though slow, they are becoming more empowered to fight for their rights.. Disability is not understood by millions of people. Our lives are not easy! I agree to that! Majority are insensitive to your needs not until perhaps they themselves get disabled for some reason, or someone in the family has disability problem. The reason why the documentaries I make for PWDs are mainly for awareness of their condition. My hope is that knowledge and understanding would follow so that our people would be more welcoming in our society. I started making advocacy films because of my grandniece with autism.